I’ve eaten these avocado soba noodles at least three times in the last week (don’t judge me!) and I have no plans to stop anytime soon. 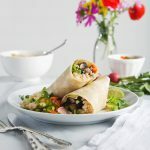 Part of this is because I took an unintentional avocado break recently and now I want to eat them at every meal, and the other part is because this recipe is extra easy. 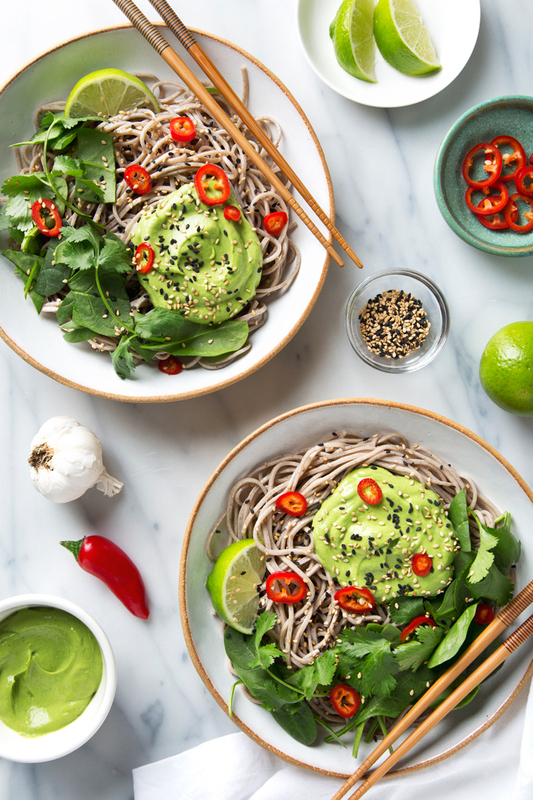 All that’s involved is cooking up some soba noodles, blending a couple of avocados, fresh herbs, greens, and garlic into a creamy sauce, and digging in. Lunch or dinner comes together in under 20 minutes! 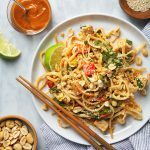 Avocado is such a game-changer when it comes to creating creamy sauces without dairy or a ton of oil, and since it’s calorie-dense and full of good-for-you fats, you’ll likely find that a smaller portion of these noodles will satisfy your hunger and keep you full for hours (every time I’ve made this recipe, my eyes are much bigger than my stomach). And because the avocado flavor is relatively mild, I like to jazz up the sauce with a generous amount of cilantro, garlic, fresh lime juice, toasted sesame oil, and baby spinach for more greens power. As a bonus, the spinach also creates the most beautifully vibrant color. Serve your noodles as-is, or top them with extra lime wedges, chopped cilantro and spinach, sesame seeds, and some sliced chilis or sriracha. I find that this meal needs some heat, although I do have a little confession to make. Do you see those pretty red fresno chilis in the photos? I picked them off as soon as we were done with our photoshoot. I was expecting them to taste like jalapeños heat-wise, but they ended up being so much spicier! 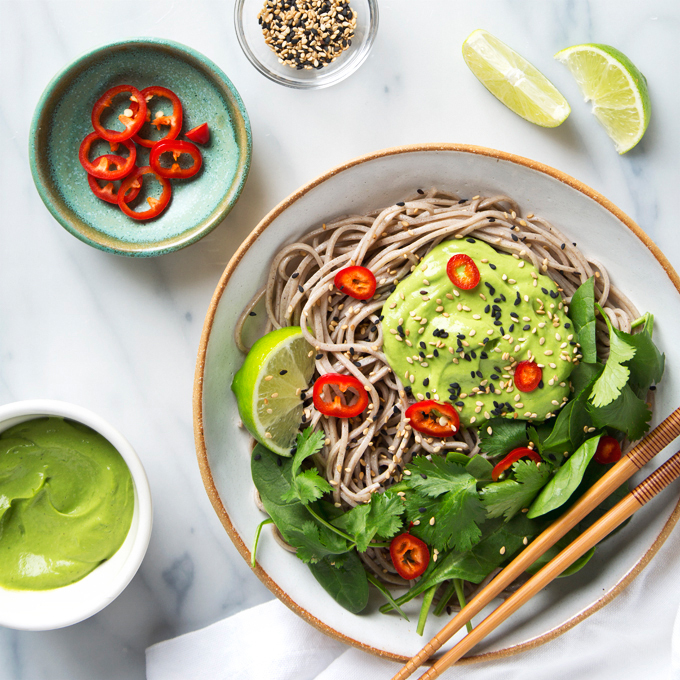 These creamy vegan avocado soba noodles require only 8 ingredients and take just 20 minutes to make! 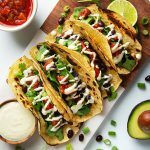 The avocados create a thick and extra rich sauce—all without any cream or dairy! Cook the noodles: Bring a large pot of salted water to a boil over high heat. Add the noodles and cook according to the package directions. Make the sauce: While the noodles cook, add the remaining ingredients to a blender. Blend until smooth and creamy, about 30-60 seconds. Season with salt and pepper to taste. Assemble the noodles: Drain the noodles, then transfer them to a large serving bowl. Pour the sauce over the top and toss to coat. Serve immediately with lime wedges, cilantro, sesame seeds, sriracha, and sliced chili peppers, if you like. To make this recipe gluten-free, use 100% buckwheat soba noodles. 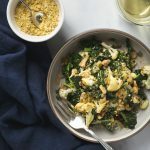 To make this recipe grain-free, use spaghetti squash or veggie noodles (zucchini, sweet potato) instead of soba. Avocados that are on the riper (read: softer) side work best to create a creamy sauce. The lime juice helps to keep them from browning, so feel free to enjoy any leftovers for 1-2 days after you make this recipe. This looks so vibrant! I have all of the ingredients to make this for dinner…yay! These colors are beautiful. Where did you buy the small turquoise bowl holding the red peppers? Avocado is one of my favorite foods but for some reason I never thought to turn it into a creamy sauce. Genius! Oh, you have to try it as a sauce with these soba noodles—I think you’ll be a big fan!